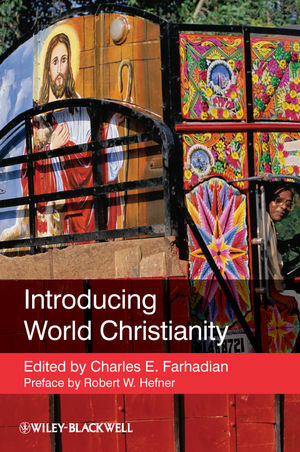 This interdisciplinary introduction offers students a truly global overview of the worldwide spread and impact of Christianity. It is enriched throughout by detailed historic and ethnographic material, showing how broad themes within Christianity have been adopted and adapted by Christian denominations within each major region of the world. Charles E. Farhadian is Associate Professor of Religious Studies at Westmont College, Santa Barbara. His books include Christianity, Islam, and Nationalism in Indonesia (2005), The Testimony Project: Papua (2007), Christian Worship Worldwide (2007), and The Oxford Handbook of Religious Conversion (co-edited with Lewis R. Rambo, 2012). 1: Middle Eastern & North African Christianity: Persisting in the Lands of Islam (Heather Sharkey). 2: Christian Belongings in East Africa: Flocking to the Churches (Ben Knighton). 3: West African Christianity: Padres, Prophets, Pastors, and Pentecostals (Ogbu Kalu). 4: Christianity in Southern Africa: The Aesthetics of Well-Being (Frederick Klaits). 5: Christianity in Western Europe: Mission Fields, Old and New? (Simon Coleman). 6: Christianity in Eastern Europe: A Story of Pain, Glory, Persecution, and Freedom (Peter Kuzmic). 7: Christianity in South Asia: Negotiating Religious Pluralism (Arun Jones). 8: Christianity in Southeast Asia: Similarity and Difference in a Culturally Diverse Region (Barbara Watson Andaya). 9: Christianity in East Asia: Evangelicalism and the March First Independence Movement in Korea (Timothy S. Lee). 10: Christianity in North America: Changes and Challenges in a Land of Promise (Kevin J. Christiano). 11: Central America and the Caribbean: Christianity on the Periphery (Virginia Garrard-Burnett). 12: Christianity in Latin America: Changing Churches in a Changing Continent (Samuel Escobar). 13: Brazilian Charisma: Pentecostalized Christianity in Latin America’s Largest Nation (R. Andrew Chesnut). 14: Christianity in Australia and New Zealand: Faith and Politics in Secular Soil (Marion Maddox). 15: Christianity in Polynesia: Transforming the Islands (Ian Breward). 16: Christianity in Micronesia: The Interplay Between Church and Culture (Francis X. Hezel). 17: Christianity in Melanesia: Transforming the Warrior Spirit (Garry W. Trompf). Conclusion: World Christianity: It's History, Spread, and Social Influence (Robert D. Woodberry).